See another side of Madrid with a local! 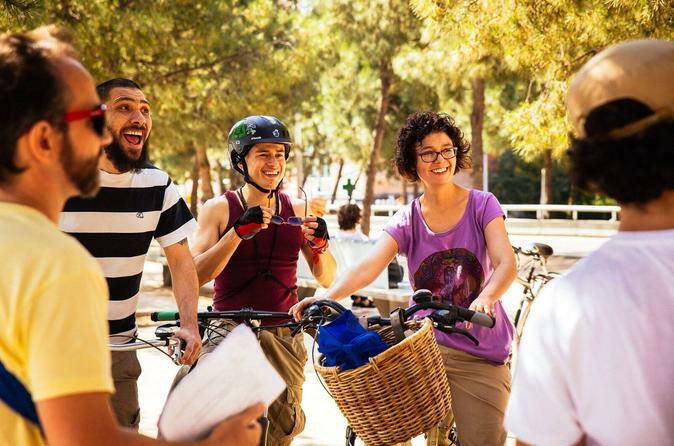 Meet your private guide at station Principe Pio and enjoy a short walk to the bike shop. Bike along the Manzanares River and get a unique perspective of the city. Start your biking route at King's Bridge, and admire the Royal Palace, a place considered one of the city’s most beautiful buildings. On the other side of the river is the beautiful Casa de Campo, the largest public park in Madrid. Your private guide will tell you the history of this park and how locals spend their time there. Move on to the next stops, pass the oldest bridge in Madrid and the old football stadium of Atletico Madrid. Next stop is Puente de Toledo, a masterpiece of Baroque Madrid, designed by Pedro Ribera, one of the most influential artists of 18th century. Beautiful designed, the Arganzuela Footbridge creates a belvedere over the park and offers you an amazing view over the Toledo Bridge. Ready to check out a famous graffiti artwork? Follow your host and cross Madrid Rio over the Matadero bridges decorated with mosaics. Admire Italian street artist Blu’s artwork and find out more about his unique style. Next stop is Matadero, a major cultural center. The building used to be the former municipal slaughterhouse, but is now a vibrant cultural center. Before you move on to your last two stops, enjoy a caña and a piece of tortilla to recharge your batteries. Hop on your bike and cycle to Ermita de Virgen del Puerto, a hidden church decorated with beautiful frescos on the inside of the cupola. The last stop is Madrid’s most surprising secret where you can look up at Goya’s frescoes mural paintings. Your local guide will show you where the painter is buried and tell you the interesting story about his death. Ready to wrap up your tour? Cycle back to the bike shop and say “goodbye” to your new friend. If you feel hungry or want to have a drink, you can ask your private guide to help you with directions on how to get to Casa Mingo. This place is famous among locals for its signature dish of roast chicken and delicious cider.